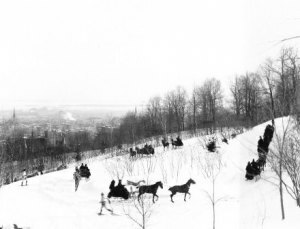 Montreal Sleighing Memories: When Life was Simpler and Winter was King! As horseman, horsewomen and history lovers, we owe famous Canadian photographer William Notman a debt of gratitude. Through his camera lens for 78 years, Notman captured the people, places and activities of Canada including the magic of Montreal winters. 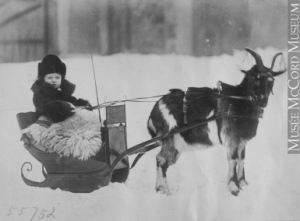 These treasures demonstrate that, far from loathing this long season, Montrealers of a century ago embraced it wholeheartedly…especially those who enjoyed sleighing in any form. The sleighs were indicative of this acceptance of winter and were built for every conceivable purpose from lowly farm and tradesman conveyance to Andrew Allan’s six horse hitch complete with postillions. Montrealers made the best of this season by travelling, partying, socializing, sporting and being seen in their sleighs complete with mounds of buffalo robes, clanging bells and drivers and passengers swathed in furs. When the garrison in Montreal was withdrawn in 1870, the officers of the militia regiments carried on the traditions and activities of the clubs. The dinner drives along Longue Pointe were wonderful opportunities to show off sleighs, harness, outfits and of course lovely lady friends and wives. These dinner/dance outings started at 3:00 p.m. and saw 50 or 60 sleighs gather at Dominion Square for positioning and photographing before moving off amidst the happy clang of bells, returning after the festivities before midnight. Arrival of the Hardy Scots! The Pre-Christmas arrival of anywhere from 15 to 50 massive 12 foot long Glengarry Sleighs bringing supplies from Ontario by Scottish farmers, was an awesome and welcome sight for housewives and servants. These farmers came from Ontario towns and villages that bore the names of their Scottish past: Dunvegan, Dalkeith, Glen Sandfield, Munroes Mills, Maxville (which was Macsville originally), Loch Garry, and the Scotch River. To undertake a journey in the old days in winter was a matter of a week — two days to come down, three days in Montreal, and two days to return. The sleighs were large home made affairs ten to twelve feet long, four to five feet wide, with sides three to four feet high. 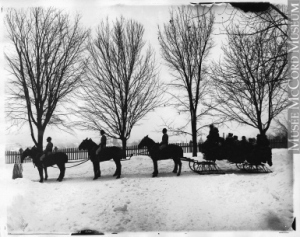 The runners were cut from a large birch or elm tree and the iron on the runners and the necessary nails and bolts were the only items bought for the sleigh. The whippletrees and traces were often the same as used for plough or harrow. 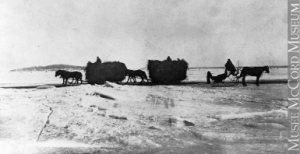 The farmers’ sleighs were very much a conveyance of convenience, there was nothing showy or fancy about them. The hardy Cameron and MacDonald farmers piled their sleighs to bursting with butter, cheese, turkeys, geese, pork, seed and hand knitted mittens. They brought along some bread and cheese and a nip of ‘something’ to ward off the cold, and with wife and children started out on the 80 mile trip from Ontario to Montreal in the nearby Province of Quebec. The first night’s stop was at The Cedars where horses were stabled for 25cents and the lodging fee of a shilling was often saved by sleeping under the sleigh’s buffalo robes in a comer of the bar. Next, the 2500 pound sleighs went onto St. Anne’s in Pointe Claire and Lachine; the best part, no doubt, was the price and the perks. Whether they partook or not, the cost for watering their horses was six-pence and included a beer! The highlight of the trip was the arrival of these sleighs. Imagine the sight of a long line of massive over laden sleighs, accompanied by the noise of bells and bagpipes, these Scottish farmers loyal to their homeland no matter what the occasion. Once in Montreal many of the sleighs went to the famous Bonsecours Market in Montreal which was inaugurated in 1847 and acknowledged still today as one of Canada’s finest heritage buildings. Our farmer and his family rented stalls for his horse at a Scottish inn for 25 cents a day, and paid twice that for his family. Everybody kicked up their heels and had a grand time, and before leaving hardware and household items were bought and that precious commodity, Liverpool salt was purchased for a shilling a bushel! With about $250.00 in his pocket, the Glengarry farmer left the bustling city of Montreal knowing that his visit was a breath of fresh air to all, himself included! The visit would be the talk of the town for months on end by both Scottish farmer and English and French Canadian Montrealers. This was just another aspect of the enjoyment of the long cold season when life was simpler and winter was king!